Culms: Erect, hollow, finely hairy below inflorescences. Blades: Mostly basal, flat or rolled inward, 1 to 7 inches long, about 1/10 inch wide, erect or stiffly ascending, glabrous or hairy, finely ribbed beneath, coarsely ribbed above; tips boat-shaped. Sheaths: Mostly longer than internodes, distinctly veined, lower portion hairy, collar margins long-hairy. Ligules: Membranous, whitish, irregularly notched. Inflorescences: Panicles, dense, erect, 1.5 to 6 inches tall, sometimes interrupted, tapered toward tips, minutely hairy; branches spreading or ascending at flowering, contracting later. Spikelets: 2-4-flowered, flattened laterally, to 1/4 inch long; glumes about equal in length, unlike in shape; lemmas slightly longer than glumes; tips pointed, rarely awned. Habitat: Dry upland prairies and open woods. Forage Value: June grass is a good forage grass but plants usually are scattered, leading to low utilization by livestock. Comments: Tufted. 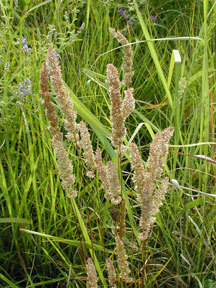 June grass varies greatly in size, inflorescence shape, and amount of pubescence. June grass was named for Georg Ludwig Koeler, (1765-1807), a professor in Germany and a student of grasses.